The sun has risen on Sunrizer for Mac. 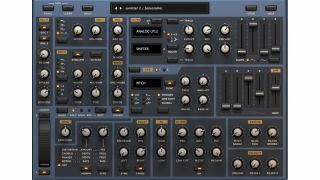 It was previewed last month, and now Beepstreet has released the Mac AU version of its Sunrizer iPad synth. Based on a subtractive synth design, Sunrizer offers two oscillators and two sub-oscillators that offer multiple waveforms, including what Beepstreet calls a "perfect emulation" of the classic Supersaw waveform. Pulse width, frequency and ring modulation are present and correct, as is a unison mode. Next come two filters, plus two ADSR envelopes and a pair of LFOs. There are effects as well, and everything is wrapped up in a pretty straightforward interface. Offering full patch compatibility with the iPad version, Sunrizer for Mac is available now from the Beepstreet website at the introductory price of £43/$50. A demo can be downloaded, too. Two LFO generators with sine, triangle, saw, square, sample & hold and random waveforms; variable phase, fade-in time and different trigger modes.